﻿ ﻿ Lord Kelvin. Nineteenth-Century Clouds over the Dynamical Theory of Heat and Light. // Phil. Mag. S. 6. Vol. 2. No. 7. July 1901.
undulatory theory of optics, is, How is it that the velocity of light is smaller in transparent ponderable matter thau in pure ether ? Attention was called to this particular question in my address, to the Royal Institution, of last April ; and a slight explanation of my proposal for answering it was given, and illustrated by a diagram. 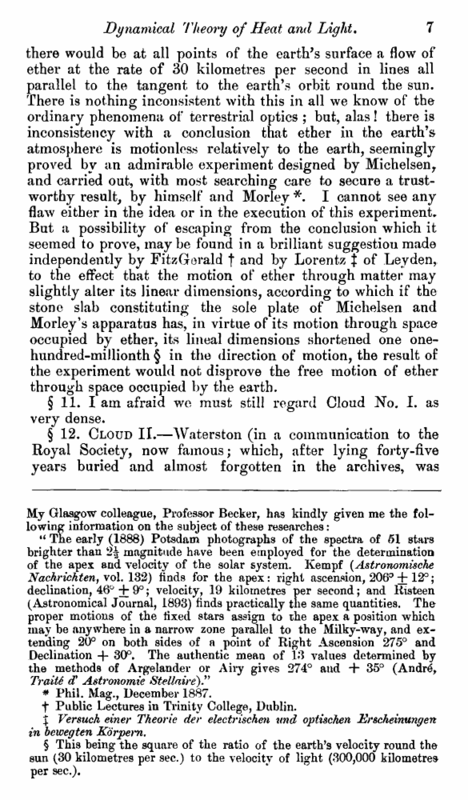 The validity of this proposal is confirmed by a somewhat elaborate discussion and mathematical investigation of the subject worked out since that time and communicated under the title, u On the Motion produced in an infinite Elastic Solid by the Motion through the Space occupied by it of a Body acting on it only by Attraction or Repulsion,5’ to the Royal Society of Edinburgh on July 16, and to the Congres International de Physique for its meeting at Paris in the beginning of August *. * Phil. 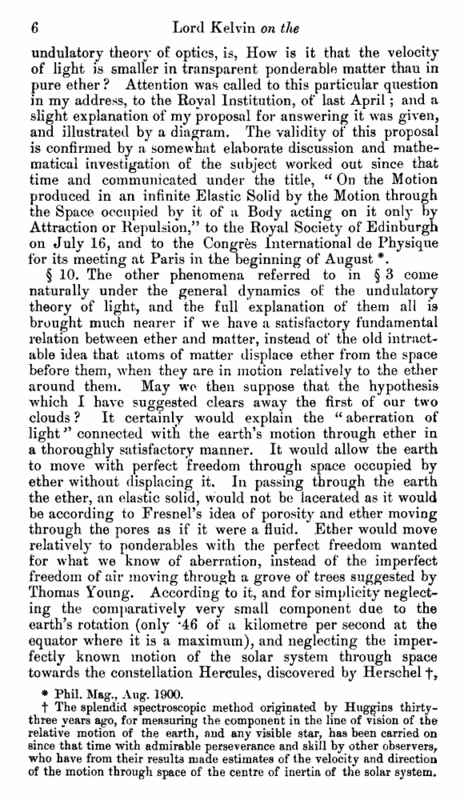 Mag., Aug. 1900.
t The splendid spectroscopic method originated by Huggins thirty-three years ago, for measuring the component in the line of vision of the relative motion of the earth, and any visible star, has been carried on since that time with admirable perseverance and skill by other observers, who have from their results made estimates of the velocity and direction of the motion through space of the centre of inertia of the solar system. there would be at all points of the earth’s surface a flow of ether at the rate of 30 kilometres per second in lines all parallel to the tangent to the earth’s orbit round the sun. There is nothing inconsistent with this in all we know of the ordinary phenomena of terrestrial optics ; but, alas! there is inconsistency with a conclusion that ether in the earth’s atmosphere is motionless relatively to the earth, seemingly proved by an admirable experiment designed by Michelsen, and carried out, with most searching care to secure a trustworthy result, by himself and Morley *. I cannot see any flaw either in the idea or in the execution of this experiment.. But a possibility of escaping from the conclusion which it seemed to prove, maybe found in a brilliant suggestion made independently by FitzGerald t and by Lorentz J of Leyden, to the effect that the motion of ether through matter may slightly alter its linear dimensions, according to which if the stone slab constituting the sole plate of Michelsen and Morley *s apparatus has, in virtue of its motion through space occupied by ether, its lineal dimensions shortened one one-hundred-millionth § in the direction of motion, the result of the experiment would not disprove the free motion of ether through space occupied by the earth. § 11. I am afraid we must still regard Cloud No. I. as very dense. * Phil. Mag., December 1887.
f Public Lectures in Trinity College, Dublin. J Versuch einer Theorie der electrischm tmd optischen Er&cheinungen in bewegten Korpem. § This being the square of the ratio of the earth’s velocity round the sun (30 kilometres per sec.) to the velocity of light (300,000 kilometres per sec. ).